Shanghai, China, October 21, 2016 /ChinaNewswire.com/ - Novotel, the international midscale brand known for its consistently high service standards, modular rooms, commitment to well-being, family offerings and stand-out meeting facilities, has introduced the Novotel Suites concept to Asia Pacific. Sharing the essence of the Novotel brand, Novotel Suites offer suite-type units that are spacious and functional, and can be adapted into a working or reception area. The rooms, which accommodate up to four people, come with a kitchenette and several amenities that cater to all types of guests and for all lengths of stays. The debut property, Novotel Suites Hanoi, presents a new option to travellers in Vietnam's capital who desire the services of a hotel with the amenities and privacy of an apartment, offering a choice of 87 spacious studios and 64 one-, two- and three-bedroom apartments. The apartments — which range in size from 48 to 104 square metres — feature the latest Novotel design, an abundance of natural light, a separate living room with IPTV, a fully equipped kitchenette, walk-in closets, and terraces in some units. Among the comforts that are not found in other serviced apartments is the Novotel Suites Live N Dream eco-friendly bedding experience with its two-sided Smart Pillow and Dual-Technology Mattress. This bedding experience is fitting, as waking up refreshed and at one's best is important in Cầu Giấy, the new urban district where the hotel is located. This burgeoning area offers proximity to office and industrial complexes, convention and exhibition centres, residential neighbourhoods, and Noi Bai International Airport. The culinary options at Novotel Suites Hanoi also set it apart from other serviced apartments. Food Exchange, the all-day-dining restaurant, features international buffet dining with live cooking stations. Guests can enjoy delectable tapas at Gourmet Bar, spectacular city views at the Rooftop Bar Terrace, and snacks and drinks at the Pool Bar. A fitness centre, heated outdoor pool, private library lounge and kids' playground assure that Novotel Suites Hanoi offers all the comforts of home — and more. “The Novotel Suites brand is designed as an attractive option for medium- and long-term stays, and is a perfect choice for business travellers and families on urban holidays,” says Patrick Basset, Chief Operating Officer of AccorHotels Upper Southeast and Northeast Asia. The brand was launched in 2010 and now has over 30 hotels in nine countries. 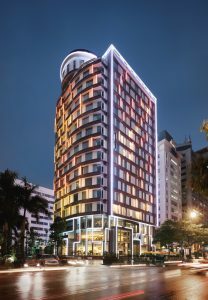 Basset adds that the latest hotel, Novotel Suites Hanoi, “is the first Novotel Suites in Asia Pacific and the sixth Novotel in Vietnam, underscoring AccorHotels' commitment to continued growth in one of the most dynamic hospitality markets in the region.” The group's 23 hotels in the country will be followed by 10 more in the next two years. AccorHotels is not only the largest international hotel operator in Vietnam, but was the first, and has been in the country for nearly 30 years. Mike Britt, the hotel's General Manager, adds that “guests of Novotel Suites Hanoi can create their own special world with all the warmth of home. It will usher in a new concept here of home-away-from-home living for long-stay travellers who are in Hanoi on business as well as their families. And with modern pillar-less meeting rooms that can accommodate up to 200 guests, Novotel Suites Hanoi's can host meetings and events in style”. The hotel's three meeting rooms offer natural sunlight and can be combined into one elegant ballroom, making it an ideal venue for small-to-medium-sized events. Additionally, the hotel is committed to an eco-friendly approach, offering an interactive white board for paper-less meetings and coffee breaks with delicious, locally grown products. Novotel Suites Hanoi is the first hotel in Vietnam to participate in the Joint Crediting Mechanism (“JCM”) programme to reduce carbon emissions throughout the property. Novotel Suites Hanoi is located at 5 Duy Tan Street, Cầu Giấy district, Hanoi, a 25-minute drive from Noi Bai International Airport. Novotel Hotels, Suites & Resorts provide a multi-service offer for both business and leisure guests, with spacious, modular rooms, 24/7 catering offers with balanced meals, meeting rooms, attentive and proactive staff, kid areas, a multi-purpose lobby and fitness centers. Through PLANET 21, AccorHotels' sustainable development program, Novotel commits to Man and the Planet. Novotel has over 470 hotels and resorts in 61 countries, ideally located in the heart of major international cities, business districts and tourist destinations. AccorHotels, the world's leading hotel operator, is present in 95 countries with more than 4,000 hotels and 240,000 employees.